Do you know what "Kamehameha" means? AB Groupe didn't or else it wouldn't have been the term used for literally everything that happens. Anyway, it means "Turtle Destruction Wave", just like how Kame Island and the Kame House mean "Turtle Island" and "Turtle House", respectively. This is because they're all associated with the Turtle Hermit (aka Master Roshi) who trains his pupils by making them wear turtle shell weights on their backs, and whose best friend is, well, a turtle. Lookin' pretty good for a 1000-year-old loggerhead. 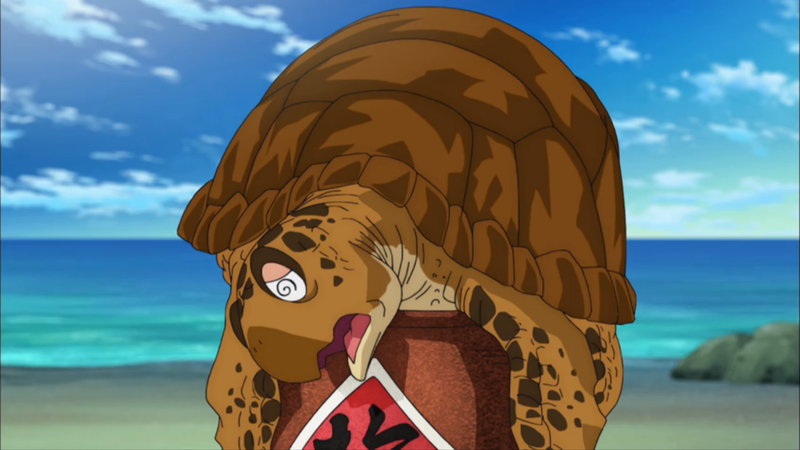 Turtle (ウミガメ, Umigame) has for at least fifteen years been my favorite character in all of Dragon Ball. He's a self-deprecating skeptic who's there to keep some of the more impulsive Kame Islanders grounded, and should be considered one of the more significant turtles in media for being one of the first friends Goku ever makes. 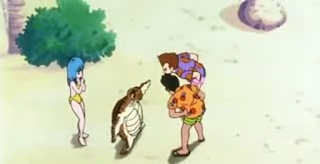 Besides Bulma, Turtle is only preceded by a dead grandpa and pet rocks. 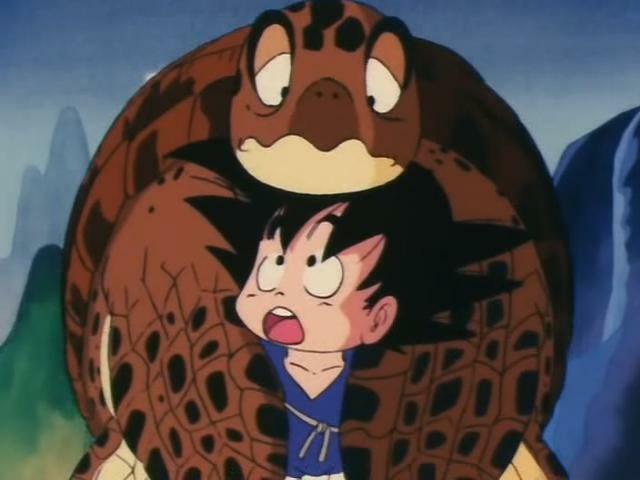 The two trained many years together, with various Turtle-involved exercises helping to make Goku strong. Very strong. So strong that when combined with quantifiable power levels (dammit Toriyama), things soon reached a point where you either possessed raw strength or were out of the game. 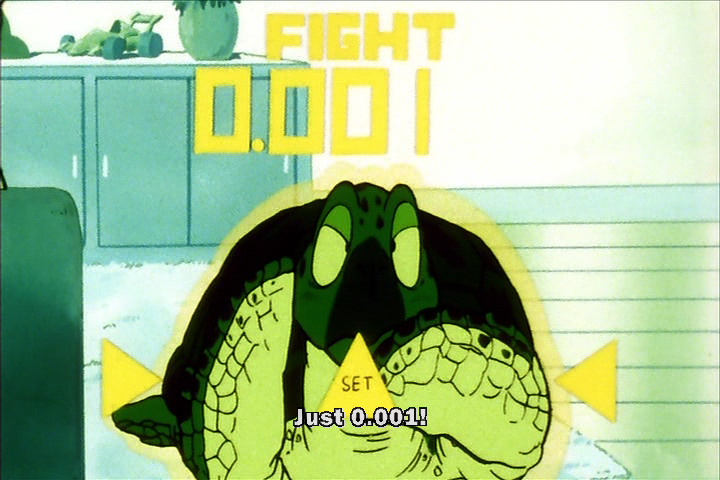 Turtle, used to demonstrate this very fact, was shown to have a power level of 0.001, while the average adult human's (based on a human farmer Raditz's had scanned previously) was ~5. Compare 0.001 to 5. That's a 5000x increase. Compare 0.001 to, say...over 9000, and that's an increase of over 9000000x. Less is more, or something. Let's test that theory via Dragon Ball FighterZ! Despite this, half a decade passes and he's in the Android saga beating two meddling thugs' lights out for threatening Krillin's ex-girlfriend. 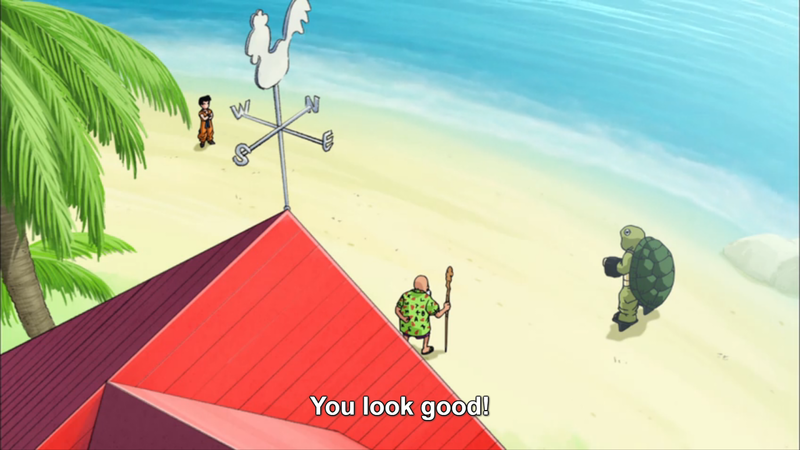 Either Turtle is way stronger than that scouter indicated or the Beach Dudes are the weakest organisms on the planet. 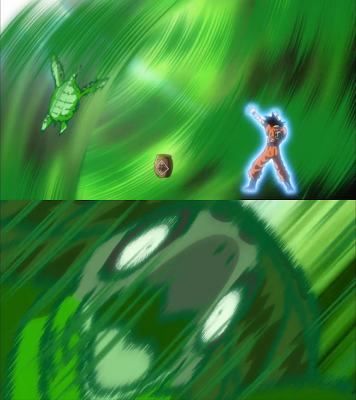 Goku practicing the Evil Containment Wave/Mafūba on Turtle. That's the Mafūba, which Cappy's Capture from Super Mario Odyssey suspiciously resembles. It's not supposed to kill people (its literal purpose is to do away with immortals), but you'd think someone with a power level of 0.001 wouldn't be alive after that, much like a certain blog after years of impressively-low view counts. 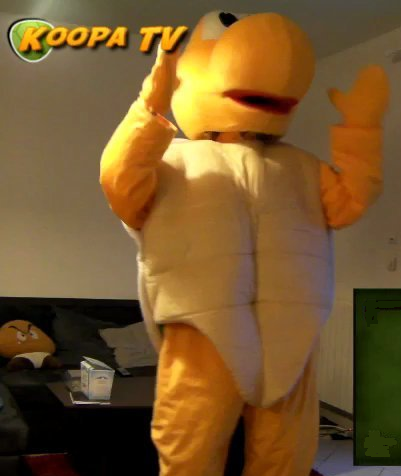 is where KoopaTV identifies with Turtle the most. Some may gasp at Turtle's above re-appropriation as a training prop and wonder how we can speak fondly of the dudes who did that to him, especially when we're already affiliated with the Ginyu Force by way of hit sensation Koopasentai. The answer is because Goku's moral spectrum is nowhere near as binary as, let's say...MARIO's, which is why Goku and the latter would never get along. Mario is evil but actively thinks otherwise, participating in rampant virtue-signaling so that he can keep all his fans and persist in his Fake News merchandising. Meanwhile, [NON-1999 DUB] Goku isn't a charlatan regarding his morality. Goku willingly endangers his family and the rest of the universe's lives for the sake of his own silly adrenaline trips, but always weathers the criticism and doesn't craft Fake News fairy tales to convince himself that what he does is for some greater admirable purpose. He knows exactly what he's doing. Similarly, the Turtle Hermit knows exactly what he's doing. Even if we (and Turtle) might go about things with a...slightly different cadence, we'd still have a modicum of respect for Mario the Predator if he just told the Princess what he was thinking already. We're not kidding about wanting a playable Turtle in Dragon Ball FighterZ for Nintendo Switch. He could work like Shuckle! Unfortunately, Turtle is not playable in Dragon Ball FighterZ, which is now released (but not on Nintendo Switch). I for one agree that Turtle IS a notable unsung hero of the Dragonball saga.